MARC CHAGALL "BOUQUET" SIGNED AND NUMBERED LIMITED EDITION FINE ART PRINT, Own it! This is an extraordinary gorgeous rare Limited Edition "Bouquet" Fine Art Print by the Marc Chagall, one of the most well loved artists. 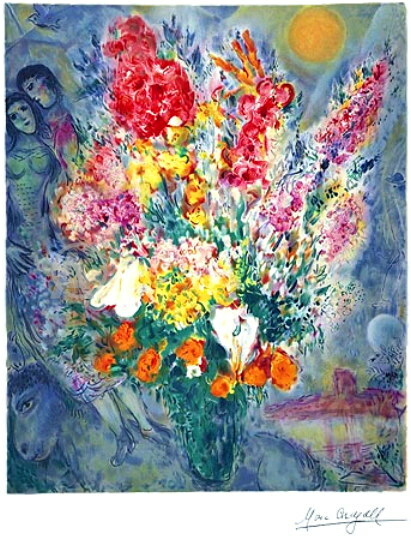 This artwork is Marc Chagalls "BOUQUET" with brilliant rich colors and visual sweep. This is an authentic Estate Approved Limited Edition Lithograph in exceptional condition. It is of the highest quality, Hand Numbered in pencil and facsimile Signed lithograph. The edition size is 2000 and was published in the 1980's. Printed on a heavy weight beautiful Arches type paper. This is not cheap reproduction, but the high quality Estate Approved Limited Edition Chagall. This item retails in fine galleries framed for over $1,000.00. We are offering it to you at a very low starting price, well below the typical Gallery price! COA Certificate of Authenticity provided on request. This piece is a lovely addition for any Chagall art lover. Own a great art piece at an affordable price. This is your chance to own this excellent art print from one of today's most collectable artists at a exceptionally affordable price. By from us with confidence! Marc Chagall(1887-1985)Marc Chagall is recognized as one of the most significant and critically acclaimed artists of the 20th century. Chagall is a Russian-born French painter, born July 7, 1887 in Russia. In 1923, he moved to France, where he spent the rest of his life, except for a period of residence in the USA. During the 1930s, he traveled to Palestine and Europe. During World War II, Chagall fled to the United States. The Museum of Modern Art, New York, gave him a retrospective in 1946 that was an enormous success. Exhibitions of the artists work from 1967 to 1977 was held at the Museum du Louvre, Paris, in 1977. Chagalls unique distinctive use of form, shape and color is influenced from Russian expressionism and French cubism. Chagall’s works are highly sought after by museums and art collectors worldwide. 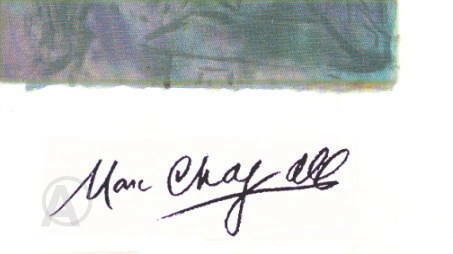 Marc Chagall Bella Fasimile Signed Hand Numbered Lithograph Art! Click the button below to add the Marc Chagall Bouquet Signed SN Lithograph Ltd Ed With COA to your wish list.